There's a saying in photography that the best camera is the one you have with you the most. For many people, that's the camera on their smartphone. Luckily for iPhone owners, the camera that comes with your smartphone is pretty impressive. In fact, recent iPhone models sport cameras that rival standalone devices that cost thousands. The iPhone camera has evolved tremendously over the years. The original iPhone took photos, but didn't do much more. The iPhone 4 added important features like flash and zoom, while the iPhone 5 brought support for panoramic images. Later models added Burst Mode, Portrait Mode, and much more. Whichever feature you're interested in, here's how to use the camera — and the Camera app that comes pre-loaded on every iPhone. The tips in this article apply to recent iPhone models running iOS 11 and iOS 12. The same Camera app is available on the iPad and iPod touch, though different models have different features based on their hardware. All recent iPhone models have two cameras: one above the screen facing the user for taking selfies and using FaceTime, the other on the back of the device for photos and videos. The higher-resolution, more feature-packed camera on the back is selected by default when you open the Camera app. To choose the user-facing camera, tap the button that looks like a camera with rotating arrows in it. The image on the screen changes to the one picked up by the user-facing camera. To change back, just tap the button again. The iPhone camera lets also zoom in or out to better capture the photo you want. To zoom in on an image, pinch the image on the screen just like you do in other apps. That is, put thumb and forefinger together on the screen and then drag them apart towards opposite ends of the screen. The image automatically adjusts as you do this. When you have just the photo you want, tap the camera icon to take the zoomed-in photo. The iPhone camera is pretty good at picking up the details in low light, but you can get really great low-light photos with the built-in camera flash. Recent models of the iPhone even include multiple flashes, which deliver better, more natural colors. Auto: Select this to only use the flash when it's needed to take a good picture, as determined by the iPhone's camera. On: With this setting on, the flash will be used for every picture. Off: The default setting for the camera. Some models of the iPhone have a dual-camera system on the back that delivers high-quality photos that apply sophisticated lighting techniques and cool depth-of-field effects. To learn about these options, read How to Use Portrait Mode and Portrait Lighting on Your iPhone. Move the Smart HDR slider to on/green to use HDR photos for all the pictures you take. If you want to also keep a non-HDR copy of your photos (this isn't necessary, but some photographers may prefer it), move the Keep Normal Photo slider to on/green. To apply the camera's focus to a particular part of a photo, open the Camera app and then tap the thing you want to focus on. A square will appear on the screen to indicate what part of the image the camera is focusing on. The focus feature automatically adjusts exposure and white balance to deliver the best looking photo, but you can also control this. Tap the screen to bring up the focus square, the swipe up and down to adjust brightness. Want to capture an immersive vista that's more detailed and spectacular than the standard image size offered by iPhone photos? Use iPhone's panoramic photo option. Even though it doesn't have a panoramic lens, the iPhone uses software to stitch together multiple photos into a single, large image. Open the Camera app and then swipe the text below the viewfinder until Pano is highlighted. Tap the button used to take photos. Move the iPhone slowly and steadily across the subject you want to capture in panorama, making sure to follow the onscreen line and instructions. When you've got your image, tap Done and the panoramic photo will be saved to your Photos app. The photo will look small on your iPhone since the screen isn't big enough to show the full-size image. Share the image to a device with a larger screen to see the full-size photo. If you want to capture a lot of photos quickly — especially if you're photographing action — you'll love burst mode. Instead of just snapping a picture every time you press the button, it takes up to 10 photos per second. Using burst mode is just like use the Camera app normally, except when you take photos you tap and hold the shutter button. You'll see an onscreen count rapidly rise. This the number of photos you're taking. You can then go to the Photos app to review your burst-mode photos and delete any you don't want. Some of the most popular photo apps apply stylish effects and filters to your photos to make them look cool (hello, Instagram!). The iPhone's Camera app has a set of filters that you can apply without using another app. Tap the icon of the three interlocking circles at the bottom corner of the app. You have 9 filter options. Each one shows a preview of what it will look like applied to your photo. Tap the one you want to use and the viewfinder will update to show the photo with the filter applied. Use the camera app as you otherwise would. The photo saved to the Photos app will have the filter on them. Apple's Live Photos format combines a bit of animation and a bit of audio to create fun, engaging snapshots. You can even apply filters loop the animations or bounce the action back and forth. 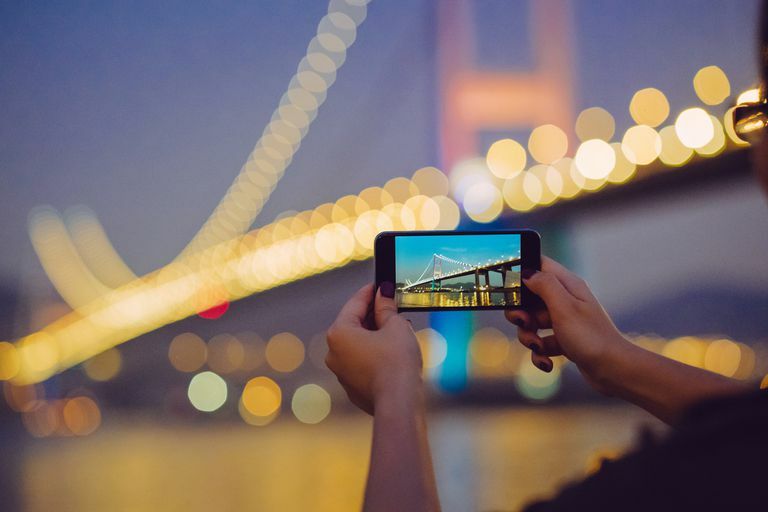 To learn all about taking and using Live Photos, check out Everything You Need to Know About iPhone Live Photos. If you're running iOS 7 or higher, you can take Instagram-style square photos instead of the rectangular photos the Camera app normally captures. To switch to square mode, swipe the words beneath the viewfinder until Square is selected. Then use the camera as you normally would. Want some help composing better-looking photos? Turn on the grid feature built into the Camera app and you'll get onscreen composition assistance. Move the Grid slider to on/green. A grid will be overlaid on screen (it's just for composition; the grid won't appear on your images). The grid breaks the image up into nine equally sized squares and can help you compose your photos. Tap the screen and hold until you see AE/AF Lock appear at the top. To turn the lock off, tap the screen again. As of iOS 11, you no longer need a separate app to scan QR codes on your iPhone. Just enable one setting and the pre-installed Camera app does everything you need. Read all about it in How to Scan QR Codes on Your Phone. Besides being a great still camera, the iPhone is also a pretty terrific video camera. Recent models can capture ultra-high-resolution 4K footage, take slow-motion video, and much more. To change the Camera app to record video, slide the words just below the viewfinder so that Video is highlighted. To begin recording video, tap the red circle button. When you're recording, the red button will blink and a timer will appear onscreen. To stop recording, tap the button again. Some still photography features, like HDR photos or panorama, don't work when recording video, though the camera flash does. You can also take still photos while recording video. Video shot with the iPhone camera can be edited using the iPhone's built-in video editor, Apple's iMovie app (Download at the App Store), or third-party apps. Along with burst mode, this is the other major improvement delivered by the iPhone 5S and newer models. Rather just taking videos that run at 30 frames/second videos, newer models can capture slow-motion videos at 120 frames/second, or 240 frames/second on some models. This can add drama and detail to your videos. To record slow-motion video, swipe the row of options below the viewfinder to Slo-Mo. Record video as you normally would. Swipe the row of options below the viewfinder to Time-Lapse.